Science Fiction Writers are often asked where they get their ideas. Almost all of them hate this question. One SF writer even famously quipped, “They get mailed to me by a gentleman who lives in Schenectady.” The truth is, ideas are easy. It is implementation that is hard. At the same time there are a couple of obstacles to an entrepreneur’s ability to implement a great idea, which at first blush seem out of the entrepreneur’s control – timing and connections. 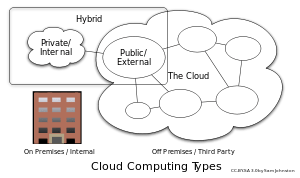 To illustrate let me tell you how I invented “the cloud”, “the cloud” that now ubiquitous ability to work collaboratively across the internet, and to store documents where they can be easily accessed by multiple users across multiple platforms. In 1988 I was working as a credit analyst in a regional bank. Our department had recently installed desktop computers for all of the analysts. At $4,000 a pop, having a desktop at home was something lowly credit analysts could only dream of. I was working on a loan presentation for a small publisher that had branched out into educational software. Their target market was the home user and they had failed to meet projections for three quarters running. A large part of the price of the hardware was the cost of computer memory. Another large component was the cost of buying and upgrading software. The software and files at the bank were stored on central servers. It was not a big leap to think that software companies could offer to store files on their central servers and hardware companies could sell bare bones machines at a much reduced cost. In hindsight, “the cloud” became ubiquitous after the cost of hardware came down and after the Great Recession, when many down-sized and laid off workers started their own businesses and a new market for cloud computing emerged. I would bet dollars to donuts that people in the industry had the same thoughts about cloud computing that I did in 1988. Maybe, they even thought it would solve precisely the same problem, although in the end it solves a different business problem. Rather than helping to bring down hardware cost, it makes file sharing easier. Ideas often come before their time and it is not always easy to see which steps will be necessary to implement the idea. Many ideas are dismissed out of hand because the path to implementation is not clear. Companies that succeed can’t afford to do this. Successful companies have a culture that fosters innovation, that allows people to make mistakes and that is flexible enough to hold onto their great ideas until technology catches up. One of the things that distinguishes true entrepreneurs from other business owners, is that entrepreneurs have the ability to dream products and services out of their ideas. Barriers to implementation are not seen as reasons to trash the idea but problems waiting for a solution. Implementation becomes the process of working through these problems to become first on the market with a new idea. So, it’s all in the timing, but more of the timing is in your control than you might think. Amazing insights here. Yes, we often come up with so many ideas, yet following through on those ideas are a completely different matter. Thanks, Annemarie, nice to see you on my site.